Buenos Aires is the seductive, lively and diverse capital of Argentina and birthplace of tango, a world renowned sultry partner dance. Choosing Buenos Aires for your honeymoon is a fine choice indeed. This vibrant south American metropolis with a European feel has much to offer passionate newlyweds celebrating their union here. Couples who love to dance can learn to tango and later put their skills to the test in one of the many clubs of San Telmo. True carnivores will love parillas — Argentinian steakhouses that abound at nearly every corner. The café culture is alive and well along cobblestone streets and packed with well dressed, confident and friendly Porteños, as the city’s residents are called. The nightlife is as colorful as its streets and bars stay open all night. Buenos Aires is a shopper’s paradise with authentic leather products, antiques and designer fashion. Many local designers have set up shop in the chic area of Palermo Viejo, a once industrial and dilapidated area that has been revamped. Check out the surprising and exciting city of Buenos Aires for an ideal honeymoon destination. Spring and autumn, which are opposite from the United States in terms of weather, are arguably the best times to visit and aren’t too cold or hot. It’ best to avoid January, which sees many tourist visits and oddly some businesses have limited opening hours. Plaza de Mayo: Argentina’s most important public square, located in the city center. Palermo and Recoleta: In these charming and historical neighborhoods are the best restaurants and Parillas. Tango Lessons: There are an abundance of options from one day to weeklong sessions. 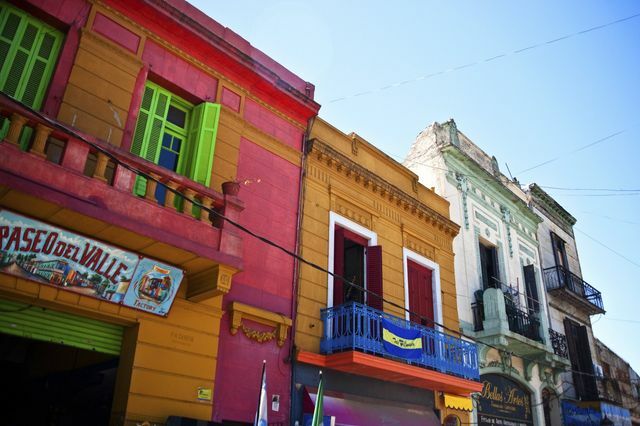 La Boca: Neighborhood in the south known for its colorful building facades on Caminito street. Carlos Thay Botanical Gardens: One of the many beautiful parks and greens spaces of Palermo. Shopping in Palermo Viejo: A once ramshackle area turned upscale abundant with local designer shops. Señor Tango: This is Buenos Aires’ most popular tango show. Sailing on Rio de la Plata: A romantic cruise on Argentina’s natural border with Uruguay. Attend a Football Match: It’s a big deal here, a must if you love soccer. Wine Tasting: Argentina is a major producer of Malbec, Cabernet Sauvignon and Syrah. Bicycle Tour: Let a guide show you the city’s best spots and colorful neighborhoods. Tigre Delta: A popular getaway from the city and interesting excursion by boat. Day trip to Colonia, Uruguay: This picturesque town is just a ferry ride away. Recommendations for activities in Buenos Aires and El Calafate (argentina)? honeymoon poll, need your help!